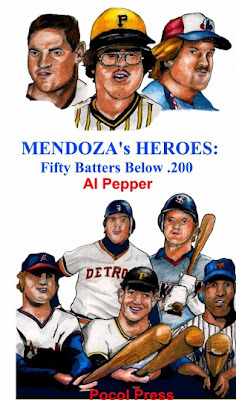 Home » Al Pepper , Albert Pujols , Book Review , Brian Doyle , Charlie Manuel , Choo Choo Coleman , Herman Franks , Luis Pujols , Mendoza's Heroes , Tony LaRussa » Is Pujols the next to join the cast of 'Mendoza's Heroes'? Is Pujols the next to join the cast of 'Mendoza's Heroes'? While Albert Pujols flirts with the proverbial “Mendoza Line,” one would consider his $30 million dollar a hefty price tag for someone whose output is resembling that of Luis Pujols (no relation), the former catcher for the Houston Astros in the late 1970’s and early 1980’s. For every superstar such as the younger Pujols, rosters across major league baseball have been filled with good-glove, no-hit backup infielders, fifth outfielders and defensive-minded catchers in the mold of the elder Pujols. Light-hitting crusaders such as Choo Choo Coleman, Brian Doyle, and Ray Oyler are valiantly profiled in Al Pepper’s book, “Mendoza’s Heroes: Fifty Batters Below .200.” Pepper provides vivid details on the un-heralded careers of these blue-collar players that struggled mightily at the plate in the majors. Included in the bunch are players that would go on to become stellar major league managers, Herman Franks, Charlie Manuel, and future Hall of Famer Tony LaRussa who is the owner of a career .199 average. While nobody expects Pujols to be celebrated as the next of Mendoza’s Heroes, Pepper’s attetion to the careers of these anonymous journeymen is a keen reminder that many in baseball have spent their entire careers fighting through the struggles that have the power to humble even the game’s biggest star.